Biography: Virginia is a creative entrepreneur, winner of best Italian entrepreneurs under 25. 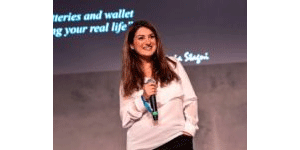 She is the founder of Logos , a tech startup designed to change our interactions with smartphones through an innovative rewarding system that values time as a new currency. She previously founded an international magazine in 2012, Revolart, and a cultural hub in Bologna (Italy), Bolognadasballo. She currently works in London at the Financial Times in the Programme Management team. Before, Virginia worked as a strategist for Freuds and as a reporter for the newspaper La Stampa. Virginia holds an MSc in Media and Communications from the London School of Economics and a Bachelor Degree in Economics and Management from Bocconi University, Milan. She is a passionate writer and motorbike rider … and she collects typewriters!